IN AN EFFORT TO deeply understand our host country, I chose to teach a unit on cultural identity to both the 9th and 10th grade classes. In Global Studies class, students studied Argentine identity through the lenses of Tango, futbol, and the iconic gaucho. Throughout each of these three lenses, the students gained an appreciation of Argentine passion, individuality, machismo. Field trips were selected and organized by Yosefa Gilon, Logistics Coordinator, and Mark McMeley (our Host-city Specialist) that could give students the emic perspective into each of these lenses. The students’ first excursion into Argentine identity was the Tango performance at the Galerías Pacifico in Buenos Aires. Before the show, I lectured about the spotty history of Tango and how the dance mimics the history of Argentina. After watching the dazzling performance of “Bien de Tango,” the students had the rare opportunity to have a private discussion with the choreographer, Federico Strumeio. The students amazed him with in-depth questions regarding the meaning of Tango and why the dance is important to him and other Argentinians. This experience was followed up by weekly Tango lessons with the fantastic Lorena Guana at a local Megatlon gym in Recoleta. Grade 11 students chose to make Tango a CAS (Creativity Action Service) activity that will help them fulfill the requirements for their IB Diploma. My grade 9 and 10 students and I chose to dance so that we could further our cultural understanding and have a fun time learning about Argentina. World Literature teacher Garrett Austen also set up a workshop to teach the students how to craft their own Tango lyrics with writer Angelino Martino (no relation to me). Through these unique activities and opportunities, the students understood how the Argentine Tango displays gender imbalances, machismo, and, most of all, passion. Passion can be seen on the streets of Buenos Aires daily. The people of Buenos Aires, often called porteños or people of the port, speak, eat, dance and party with passion. The main way TGS studied Argentine passion was through the sport of fútbol, or soccer as we goofy Americans call it. The lens of fútbol also illuminated the anthropological concepts of socio-economic status, gender and manhood, immigration, and the individual over the collective. Students learned in class about the British origins of fútbol in Argentina and how the game changed to be more about individual skill than team play, a concept also seen in the iconic gaucho way of life. In order to gain a deeper appreciation for the sport and its importance in Argentina, the students took field trips to La Bombonera and El Monumental stadiums, which are the homes of the two biggest teams in Argentine fútbol, Boca Juniors and River Plate. This is without a doubt the biggest sports rivalry in Argentina and arguably the world. The fútbol portion of this unit ended on October 28, 2012, the day of the Superclásico, when the two teams faced off and ended in a 2-2 draw. TGS became so enamoured with fútbol during the unit that they started their own team, which is the first sports team here at TGS. They have played scrimmages against our host school, San Javier, and had a community scrimmage during our field day in at St. Thomas. 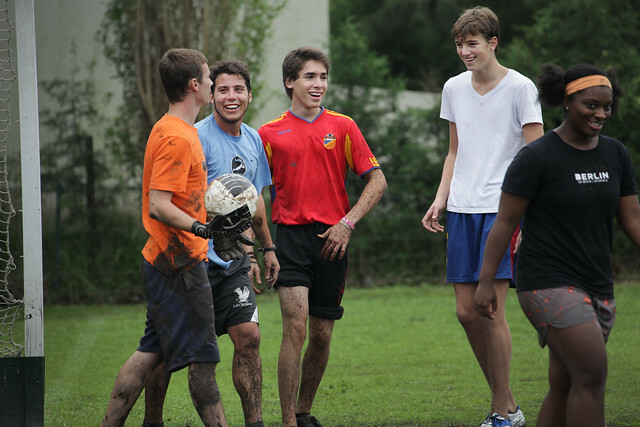 Fútbol was a great way to meet and develop relationships with our Porteno neighbors. The most important icon to Argentinians is their nomadic rider of the plains, the gaucho. Students were taught how the gauchos were the original Argentines. They were Spanish settlers that mixed with nomadic indigenous populations, and, through this mix, they created a cultural identity based on Spanish horsemanship and nomadic individuality. One Sunday, I led a trip to La Feria de Matadores to see and interact with gauchos who sell their leather products and show their cultural heritage through a dance called the Malambo. Students interviewed the gauchos, participated in the dances, and compared their experience to the most famous gaucho-esque poem Martin Fierro, written by Jose Hernandez, which they read in World Literature class. Students connected the ideals of the gaucho further on our whole school trip to La Estancia Candelaria, where we again saw traditional gauchos dancing the Malambo and showing off their horsemanship skills. Students also had the opportunity to horseback ride through the woods and see the evolution of the gaucho from free riders of the plains to ranch hands on cattle and soy farms. This was further explained when grade 9 student Sydney Morris presented on Argentina’s 4th president Domingo Faustino Sarmiento’s work, Facundo: Civilization or Barbarism. Sarmiento argues that Argentina had to move forward from the days of the gaucho and become more educated like European countries. The lenses of Tango, fútbol, and the gaucho proved to be a great way to further examine Argentine culture and get an emic understanding of our host country. The students were asked to create a product of their choosing that explained the Argentine identity through these lenses, and this work can be found on Spot.